I was wondering the other day (as you do) which of the MDX cell properties Excel PivotTables actually support. This page has all the details on the cell properties that are available in an MDX query but most client tools don’t bother retrieving all of them and Excel is no different. Of course it retrieves the most important properties and it retrieves one or two others, but I couldn’t resist doing a bit of research to find out the exact situation with Excel 2013. When you have a large number of databases and cubes on your server, and/or complex security, because a side effect of the way Excel retrieves properties is that it causes all cubes in all databases to be loaded, their MDX Scripts executed and security evaluated. See here for more details. When your queries return a lot of data and your network is slow. See page 61 of the SQLCAT Guide to BI and Analytics for more details. In the cell properties clause of this query you can see the six properties returned. Here’s a breakdown of each of them. Excel doesn’t actually retrieve the FORMATTED_VALUE cell property, which gives you the measure value with formatting applied by SSAS. Instead, assuming you have the Number Format box checked in the Connection Properties dialog, it retrieves the VALUE property from SSAS (which contains the raw, unformatted measure value) and the FORMAT_STRING property (which contains the format string you defined on the server). It then tries to convert the format string into an Excel format for the PivotTable. Unfortunately it can’t always do the conversion successfully – I blogged about a problem with the Percent format some time ago and this is still a problem with Excel 2013. Excel also doesn’t support formats defined in the fourth section (see here for more details) of the FORMAT_STRING property for null values, and there are probably lots of other relatively obscure types of formatting it doesn’t support too. The language property of a cell controls things like the currency symbol displayed when you are using the “Currency” built-in format string and the thousands and decimal separators used. 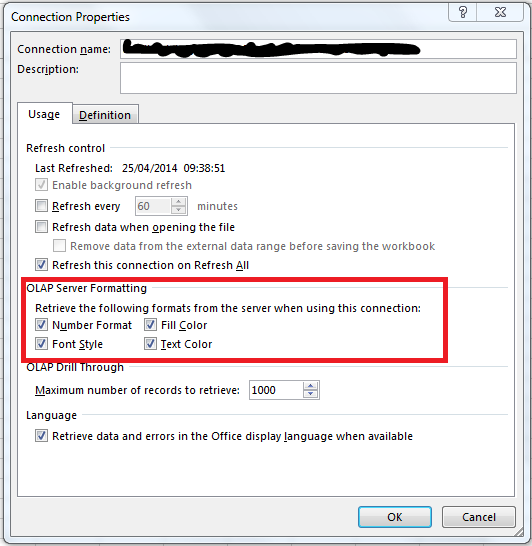 Whether Excel returns the language property or not is also linked to the Number Format checkbox in the Connection Properties dialog. I strongly recommend that you do not use the “Currency” format string and the Language property if you are working with multiple currencies, for reasons I outlined here. I’ve never particularly liked using the BACK_COLOR and FORE_COLOR properties on a cell to do traffic light-style reporting, to be honest, although I know some people love it. However I do use these properties a lot when debugging scoped assignments as seen here. BACK_COLOR is retrieved if you have the Fill Color box checked on the connection properties dialog; FORE_COLOR is retrieved if you have the Text Color box checked on the connection properties dialog. In my recent post on web services in Power Query I mentioned that while the Power Query Web.Contents() function generates a GET request by default, you can make it generate a POST request by specifying the Content option. Since this is a useful thing to be able to do I thought I’d put together a detailed example of how this works. You can see here how the list of locations is passed to the Web.Contents() function (documentation here) via the Content field; notice also that I’ve had to use Text.ToBinary() on the text that I’m passing in. You can download the sample workbook here. I stopped writing book reviews on my blog a long time ago because, frankly, I knew most of the authors of the books I featured so it was hard to be impartial. That doesn’t mean I can’t plug my friends’ books in a totally biased way, though, in the same way that I plug my own books/courses/consultancy etc! I’ve known Paul te Braak for several years now and he’s one of the best SSAS guys out there. “Microsoft Tabular Modeling Cookbook” is a great introduction to building models in Power Pivot and SSAS Tabular models, and also covers client-side interaction with Excel and Power View. As the name suggests it follows the cookbook format rather than the more verbose, traditional tech book style of, for example, the SSAS Tabular book that Marco, Alberto and I wrote. I like the cookbook format a lot – it gives you information in a concise, easy-to-follow way and doesn’t force you to read the whole book cover-to-cover. Paul has done a superb job of covering all of the important points without getting bogged down with unnecessary detail. Highly recommended. If you’d like to subscribe to my MDX course then you can get a 10% discount by using the code TECHNITRAIN2014 when registering. When you subscribe you also get access to the entire Project Botticelli course catalogue including videos on Power Pivot, DAX, SSAS data mining, Excel and much more, recorded by the likes of Marco Russo, Alberto Ferrari and Rafal Lukawiecki. Basically, when you run a CREATE SESSION CUBE statement SSAS creates a shadow copy of the cube on disk – and if you have a very large cube, with very large dimensions, this could use up a lot of storage space on the server. 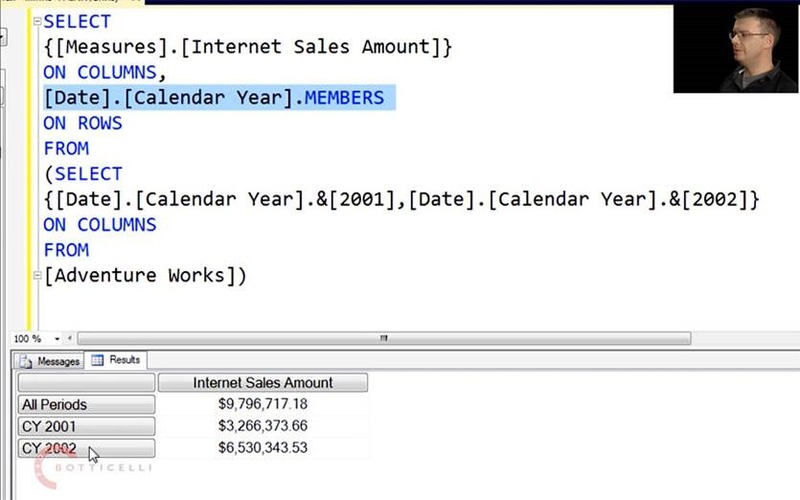 When you use the custom grouping functionality in a PivotTable Excel generates a CREATE SESSION CUBE statement behind the scenes, so it’s possible to cause a lot of mischief just by using custom grouping in Excel. Incidentally, this isn’t a problem for SSAS Tabular because it doesn’t support the CREATE SESSION CUBE statement. I always knew this particular functionality could be very slow and always warned people against using it, but I didn’t know about the disk space issue… if your users haven’t found out about custom grouping yet, I recommend you don’t tell them about it!